Typical human homes are full of obstacles and difficulties for cats. They meander around large furniture and find a spot for themselves but often face barriers that keep them from performing day to day activities. As a pet parent, your job is to create a small home within your home for your beloved furry pal. 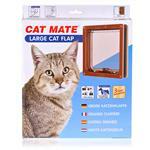 Buying simple things such as cat ramps and door flaps make things a lot easier for your pet. Cat beds are also essential purchases because they keep your pet's warm body away from the cold floor. If your cat has a habit of sleeping outside then consider buying an outdoor cat bed to ensure it gets a proper sleep whenever it needs one. Pet owners who love to travel with their feline buddies should also consider buying quality cat crates. These products create a cozy little room for your cat and ensure your pet remains comfortable throughout your travel. At PetCareRx, we have a dedicated section for cat crates and furniture. 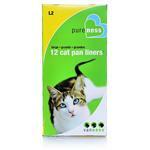 Browse our site to find the ideal pet furniture for your cat and your home. We feature things that your cat would fall in love with instantly including cat doors, scratching posts, window perch, and comfortable beds.